One of Andrew’s favorite places was Florida and most of all Disney World. Andrew was granted a wish through Dream Factory for our trip to Disney World. We stayed at “Give Kids The World” and went to all of the theme parks during our stay. 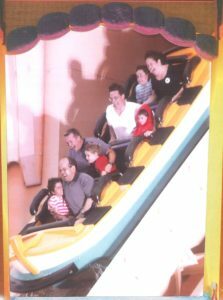 Below left is a photo of the first ride we took at SeaWorld. If you zoom in, Andrew is in the red poncho next to me. Look at the fantastic smile on his face. All the others, including me, have the look of horror. All he said when we got off was, “let’s go again”. And that’s what we did, over and over. You see, with the “dream pass”, you just go to the front of the line, no waiting. I guess that’s the point-you are supposed to get a life time of memories on the trip and that happened. The Andrew Olson Foundation has granted some wishes including sending a boy and his family to Disney World. 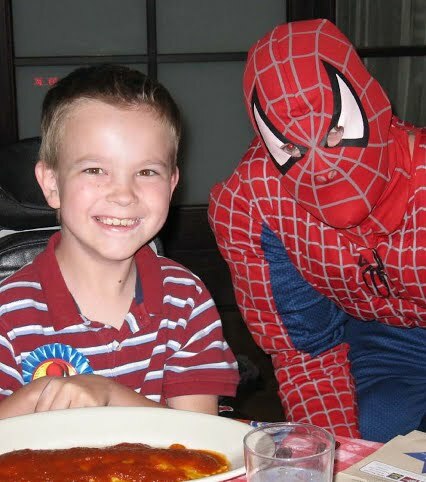 Zack, shown below, with Spiderman during breakfast just before they left for Florida, was the first child Andrew’s Foundation sent to Disney. In honor of Andrew’s 13th birthday on January 29, 2013, we were able to send 2 more children to Disney World all due to your generosity. Your support is greatly appreciated!